Residue: Proximal Interactions is a video by Trudi Lynn Smith and Kate Hennessy. 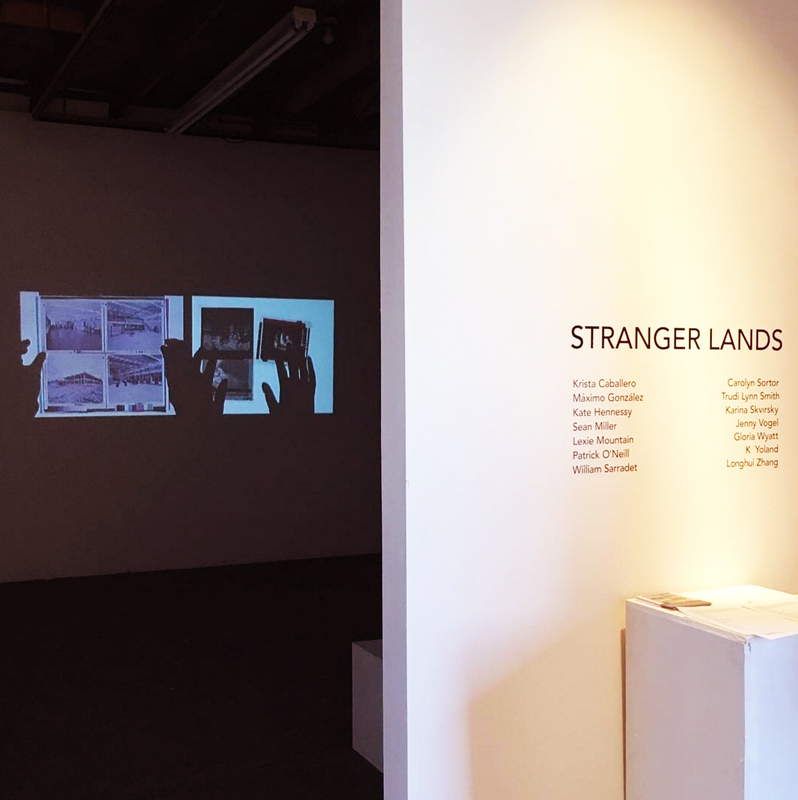 It is a part of the exhibition Stranger Lands at 500X Gallery in Dallas, Texas, curated by Julie Libersat. It runs from May 6 – June 6 2017. Residue is an ongoing project that documents examples of anarchival materiality in archives. Chemical reactions, mould, rot, and other proximal interactions render archival materials as fugitives––eluding preservation, and anarchival––marked for destruction. Proximal Interactions was created at the British Columbia Provincial Archives and is shown as a two-channel video projection. 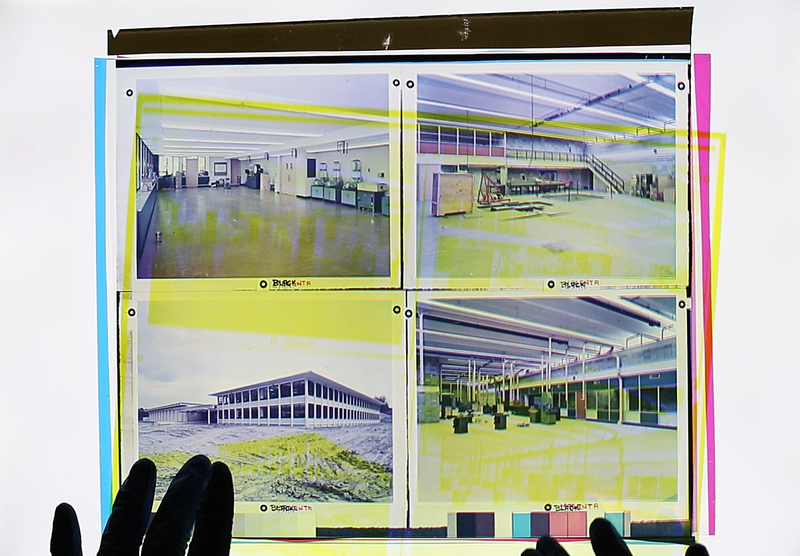 On the left, gloved hands layer four-colour separations documenting bureaucratic structures. The action of layering imitates the ephemerality of colour in film and photography archives where deterioration of acetate and nitrate negatives and colour fading challenge and shape archival ordering. On the right, the order of the archive is re-worked through the formal properties of ruby-lith (a masking film used in orthochromatic printing as a way to block information), and the gooeyness of deteriorating acetate negatives. Proximal Interactions acknowledges and visualizes the agency of anarchival materiality, where the order and structure of human-made archives are challenged by the lively anarchy of the materials themselves. Classification systems, spatial organization, and human responsibilities and actions are all fundamentally reshaped and determined by the uncooperative residents of archives, who constantly remind their stewards of the transformative, organic, passing of time, and the collusion of natural processes in undermining the human desire for stability and persistence. Photo by Julie Libersat, 2017. Born 1973, Halifax, Nova Scotia. Lives in Victoria, BC. Trudi is an artist and anthropologist with an Interdisciplinary PhD from University of Victoria. Her research addresses political and material entanglements between photography, archives and places. She reworks formal aspects of photography — a relationship between durable images and electromagnetic radiation — to emphasize the materiality of the unfixed image. Place-specific works have been installed in National Parks and urban sites in Canada and the USA; and she has exhibited work at Third Street Gallery (Easton); Crane Arts (Philadelphia); Open Space Gallery (Victoria) and Southern Alberta Art Gallery (Lethbridge). Trudi’s work has been published in journals such as c-theory, Anthropologica, Visual Anthropology Review, and Imaginations. She is currently Artist-in-Residence in the Making Culture Lab at SFU. Born 1975, Galiano Island, BC. Lives in Vancouver, BC. Kate is an Assistant Professor specializing in Media at Simon Fraser University’s School of Interactive Arts and Technology. Her research explores the role of digital technology in the documentation and safeguarding of cultural heritage, and the mediation of culture, history, objects, and subjects in new forms. Her video and multimedia works investigate documentary and archival practices to address histories of place and space. Her work has been published in journals such as Leonardo, American Indian Quarterly, and Museum Anthropology Review. Kate’s work has been exhibited at VIVO Media Arts Centre (Vancouver); Crane Arts (Philadelphia); Reach Gallery Museum (Abbotsford); and the Capture Photography Festival (Vancouver). She has co-curated and produced exhibits for the Virtual Museum of Canada. She leads the Making Culture Lab at SFU. Trudi and Kate are two of the co-founders of the Ethnographic Terminalia Collective. Ann ten Cate, Betty Walsh, Ember Lundgren, Emma Wright, David Alexander, and Anyur Kadir.